They say variety is the spice of life. These lightweight, multi-active mid ankle shoes are perfect for sampling all it has to offer. Built for comfort they’re 100% waterproof with a high quality GORE-TEX® lining, which is designed to let excess heat out, without letting the weather in. A higher cut on the ankle gives you greater support for tricky terrain, while specially placed cushioning and stability provides all-day hiking comfort. With the Explorer Active Mid, you have everything you need to take on the world. GORE-TEX® WATERPROOF GUARANTEE Keep feet dry with the incredibly waterproof and breathable GORE-TEX® lining. So say goodbye to steamy socks. ALL DAY HIKING COMFORT Superb cushioning from OrthoLite® footbed combined with EVA midsole helps to absorb shocks for greater comfort on rough terrain. 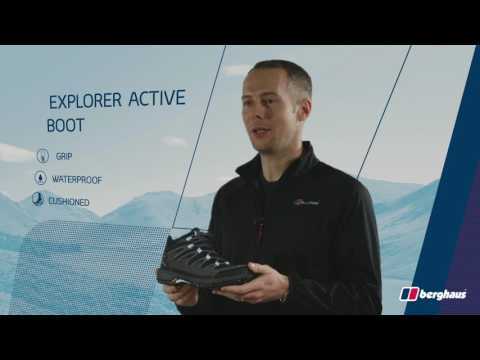 INCREDIBLY VERSATILE As tough as boots but as light and agile as a shoe, you can wear these over a massive range of activities.